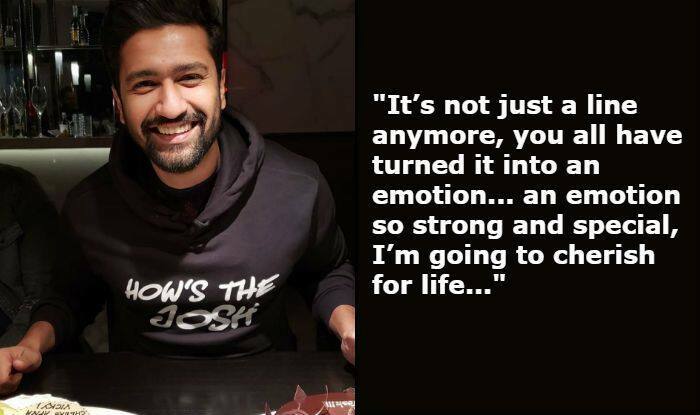 Read what Vicky Kaushal has to say to fans who have made 'How's The Josh' a rage. Actor Vicky Kaushal has taken to Instagram to share a heartfelt note thanking his audience for turning a mere dialogue from his film into a rage. The actor’s one-line dialogue, ‘How’s The Josh’ from Uri: The Surgical Strike has become a part of popular culture and is being used by the people everywhere from home, colleges, schools to offices and even in the parliament. Just a day ago, interim Finance Minister Piyush Goyal used the line while presenting the Union Budget in the parliament. Several videos surfacing on the internet show people using the line in their day-to-day life. Recently, even Vicky got a thumping response from people at the Wagah Border when he asked them ‘How’s The Josh’. The film is going from strength to strengths at the Box Office and is close to reaching Rs 200 crore at the Box Office.